New Castle County Government Center is located at 87 Reads Way, New Castle DE 19720; New Castle City/County Building is located at 800 North French Street, Wilmington DE 19801; phone: 302-395-8383. New Castle County's website carries the tagline, "The first county in the fist state." One historic place which perhaps best encapsulates this significance is the County Courthouse Museum, a National Historic Landmark since 1972. It was built in three sections spanning more than a century, 1730-1845. 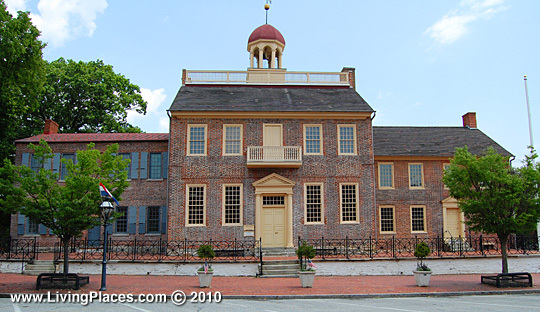 It served as the Delaware State House during colonial times, the New Castle County Courthouse after the capital was moved to Dover, is richly intertwined with the history of the underground railroad ... it's significance is well reported and fills volumes. (for more info on the this landmark property, see: New Castle Courthouse).